The above coordinates are for a Father and Daughter Gravestone in the Graveyard of The Thomas the Apostle Church, Isle of Harty. The coordinates of the cache can be worked out at the start of the Excellent nearby walk, and cache picked up enroute. Writing to a former rector to apologise for being unable to attend Harvest Festival at Harty the late Poet Laureate Sir John Betjeman said: "Alas I shall have to console myself with memories of the church in its splendid isolation, with sea birds wheeling by and the Thames so wide as to be open sea, and air so fresh as to be healthier than yoghurt [unflavoured]." Called Hertei in the 1086 Domesday Book, the church would appear to pre-date the Normans and be Saxon in origin. Sheppey had been attacked by the Danes several times and it would appear that the Normans rebuilt a church probably damaged by the Danes in the previous 200 years. 1089 AD has been suggested for some of the Norman work. 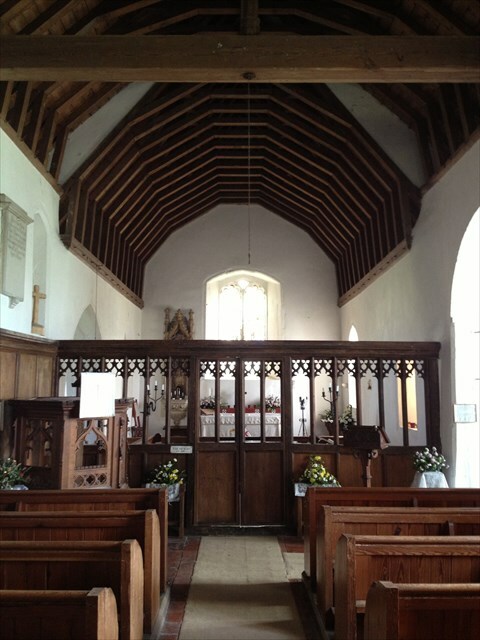 As built the church had a nave and chancel, as it stands today there is also a north aisle, porch, north chapel and Lady Chapel on the south side. The north aisle was added around 1200 while the [now blocked] south door is also dated to the same period. There is a sun dial scratched into the stone adjacent to this door to time the Mass. The church has an bell cote supported on a solid internal timber frame, resembling a watch tower. This work appears 15th century in date but a local 'expert' has a theory that the church was actually 'built around a Saxon watchtower'. 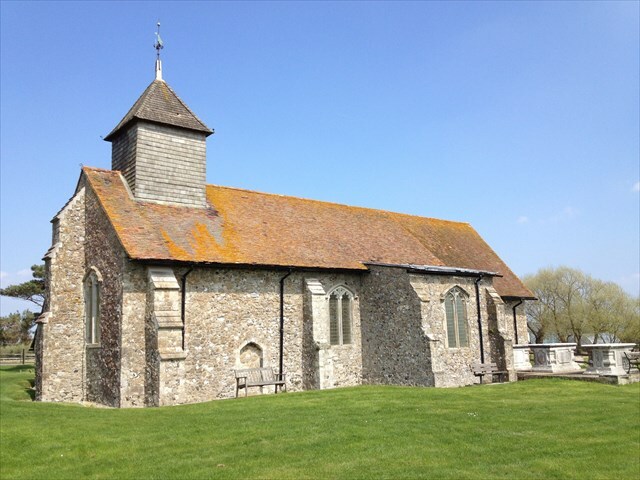 Sheppey also boasts Minster Abbey, All Saints at Eastchurch and Holy Trinity at Queenborough. At the time I put this cache out I think this is only the 2nd CM on the Island. The church stands next to the moat of Sayes Court which is now derelict, having been hit by a bomb in WW2 which also slightly damaged the church. Externally there are three table tombs to the Randall family and one heavily eroded gravestone bearing a skull and crossbones. The church is in a wonderful position, there is ample opportunity for bird watching (at least 6 varieties of Birds of Prey which you will find out if you complete the Hearty cache series) in an area which teems with wildlife. At least eight pairs of owls roosting locally. 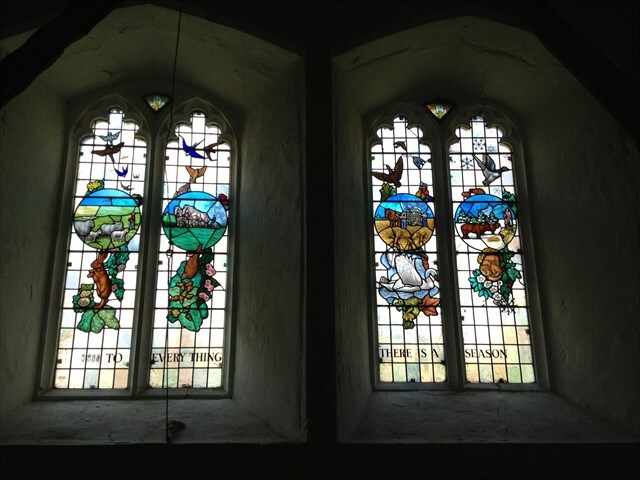 There is a wonderful stained glass window of an owl in the church which was probably locally inspired. The Church has no electricity which is quite rare in the 21st Century. At the above listed coordinates you will find a Gravestone with Father and Daughter (both honoured) on.